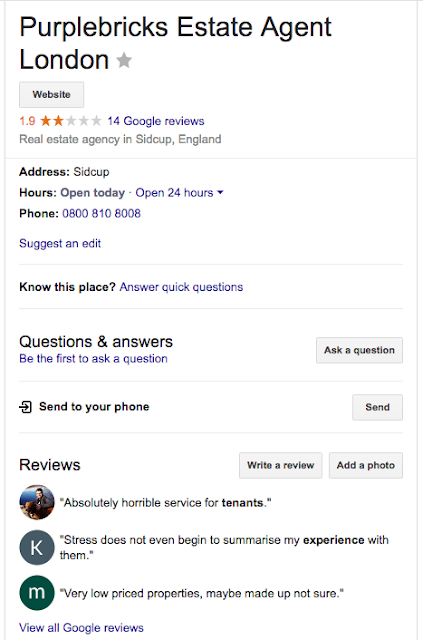 HelpHound Blog: Purplebricks - the Emperor changes its clothes? Today Purplebricks announced that they will be 'adding another independent reviews site': Feefo. This raises at least two important questions: Is it possible that Trustpilot have resigned? And why Feefo? We will probably never know the answer to the first question (only time will tell - but Purplebricks are highly unlikely to be using both at the same time), but we can make a pretty accurate guess at answering the second. What is the difference between Trustpilot and Feefo? Simply put: the first is an 'open' site - meaning that anyone can write a review at any time of their choosing, the second is a closed, invitation only, site - meaning that the business controls both the timing of the invitation and the identity of those invited to review. a much rarer beast, partly because it goes against - in the UK at least - the spirit of the CMA rules (that state that consumers should be allowed to write reviews at a time of their own choosing) - and partly because it, wittingly or unwittingly, hands considerable power to the business. Why? Because it is reliant on the business supplying it with all its customer's email addresses. They work pretty well for online retail (at least, they do now, now that they have found a way of separating reviews of the product in question rather than the courier used by the business! ): the shoes get five stars? - buy them, one star? - avoid. But do they really add value for consumers? - are we not interested in more than just how the purchaser felt about the shoes straight out of the box? Did they wear well? With a 'closed' system the purchaser has no way to go back six months later to say the heel fell off. Now let's look at the effect of 'cherry-picking' (the habit of only inviting 'happy' customers to write reviews). Online retailers don't bother - why should they? - all their products score 4.5 out of 5 and if they occasionally list one that scores badly they just drop that product line. As a result they are pretty well guaranteed to be compliant with the CMA's rules. But a service business? That's a whole different kettle of fish. Service businesses tend to be 'high-value-per-transaction/low-turnover' and that has massive implications where reviews are concerned. Just one convincingly-written but factually inaccurate review has the power to significantly harm a business - to stop the phone ringing. 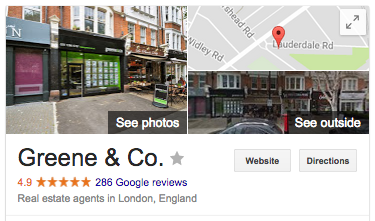 So, given a closed review solution, what is this kind of business tempted to do? You've got it - they are 'careful' about who they ask to write a review. They cherry-pick. And as soon as they do that all credibility flies straight out of the window. Who only wants to read what a business's happy customers think of it? No-one, that's who. Our guess, and it is only a guess, is that criticism of the way Purplebricks were perceived to be using Trustpilot has led them to choose a closed system (or maybe it's the 959 negative reviews - six in the last 24 hours; it will be interesting to see how Feefo's results compare), for all we know the same criticism has led to the management at Trustpilot back at their HQ in Copenhagen to review things too. We will be monitoring what happens next very closely. 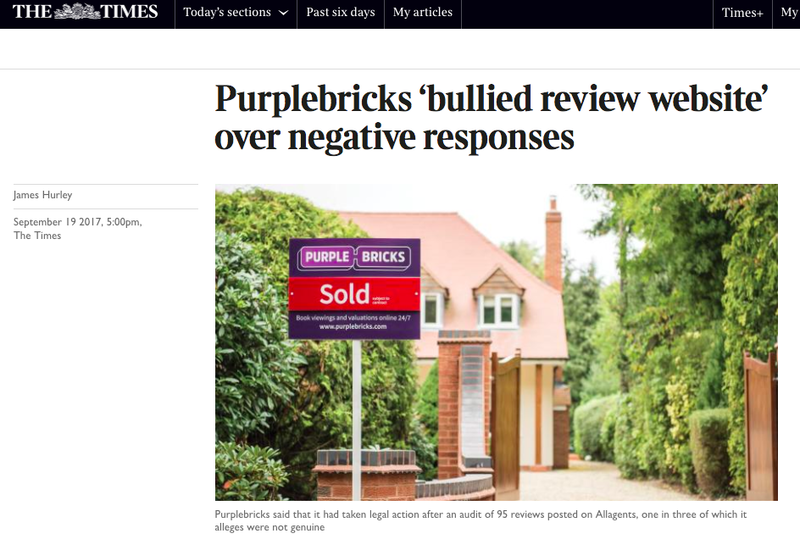 Purplebricks CEO Michael Bruce is quoted as having said "Partnering with Feefo demonstrates our commitment to growing customer trust and it is another step towards greater transparency in estate agency. Customers and brands alike trust Feefo because they know Feefo reviews are the real deal." "Greater transparency"? We will be keeping an eye on how many non-completes are invited to write a review. "customers ...trust Feefo"? Rightmove's recent survey said only 2 in 100 recognised the brand - some way to go, but we'll see if working with Purplebricks boosts that number - and in which direction. Meanwhile - for those considering either an open or a closed system - don't. The only place you should be looking to get reviews is on your own website and on the 'open' site of all 'open' sites: Google. And luckily that's where all your potential clients will be looking. Now all you have to do is find a system that will enable to do that with total credibility and without exposing your business to unfair, inaccurate or misleading reviews (or attack by your competitors) - welcome to HelpHound!